In China, the closest you can get to the French region of Provence is a remote mountain community in Yunnan. It is there that formerly Shanghai-based artist Shen Jianhua moved to open his communal art school. It is like a small pocket of utopia in China, but it definitely stands at odds with the prevailing values and attitudes of dominant contemporary Chinese society. 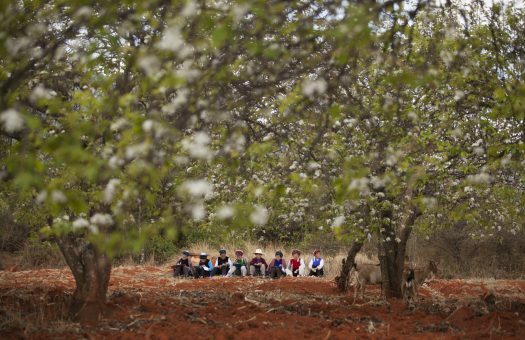 Hybrid filmmaker Zhang Yang documents the rhythms of Shen’s quiet retreat in Up the Mountain, which screens tonight during this year’s Film Comment Selects. Without a doubt, Up has to be one of the most colorful Chinese documentaries of recent vintage, especially from a filmmaker with indie cred. It is easy to see why the green fields and vivid wild flowers have inspired Shen and those who study with him. The star pupil is Zhao Dinglong, the master’s star protégé, but most of his students are seventy and eighty-year-old aunties from the village. Zhang’s observational film never patronizes the seniors studying with Shen. Nobody thinks of their work as cute or empowering, because it is straight-up good. Frankly, some of the best visuals in the film come from their colorful canvases. They clearly take it seriously and so will the audience. Of course, not everyone appreciates life on the mountain as much most viewers probably will. The drama will come from Zhao and his fiancée, Xu Lin. She agrees with her parents and his parents that it is time for him to leave Shen and get a real job in business. However, the Zen-like Shen recommends Zhao invite her to spend time at the school, so she can come to appreciate what it means to him. It is sage advice, but the results will be somewhat ambiguous. Frankly, Up is not the sort of film you watch for high drama. It is rather easy-going, even by documentary standards. Zhang is more interested in soaking up the vibe and texture of life in Shen’s artist colony, much like he did in his Eastern Western narrative Soul on a String and his more narrative-driven documentary, Paths of the Soul. The extremely boxy aspect-ratio almost looks like a mistake at first, especially since the sides of the familiar dragon logo of the State Film and TV Bureau are cropped off, but it gives the film an intimate focus that really draws viewers in. Regardless, Shen emerges as an enormously intriguing, if somewhat inscrutable figure during the course of the film. The super-cool sunglass-donning artist always seems to have a knack for saying the right thing to bring peace to his pupils and to facilitate their artistic development. Zhao and Xu Lin are also a ridiculously attractive couple, whom we start to root for. Clearly, it is Shen’s deceptively calm iron will that sustains his school. Outsiders just don’t seem to get it, even though anyone watching Up will immediately understand its charm. Essentially, Up is the indie documentary equivalent of a lazy afternoon nap in the countryside, but with some really striking folk-style painting. 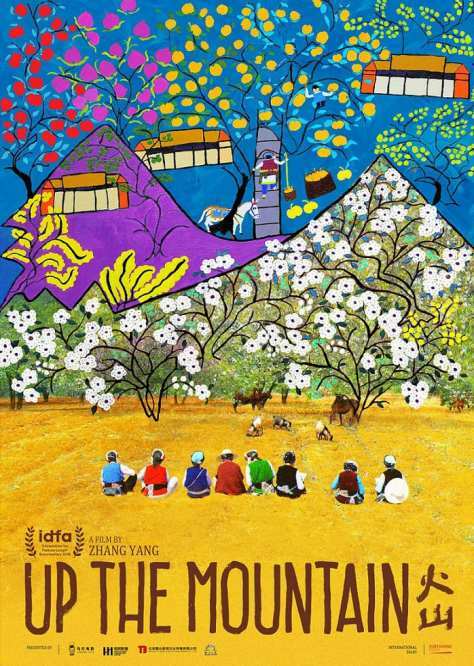 Recommended for patrons of Chinese independent cinema and regional art, Up the Mountain screens tonight (2/10) at the Walter Reade, as part of the 2019 edition of Film Comment Selects.